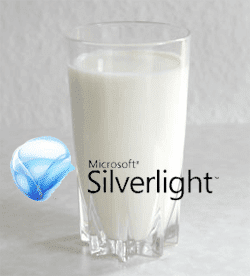 Brad Abrams must have had some fresh milk in his refrigerator when he predicted on August 25th that Silverlight 1.0 would be released before the milk in our frigs expired. Either way, three days later than I predicted, we finally have an official Silverlight 1.0 release. The release itself does not contain many surprises, but Microsoft did make some interesting revelations today. First, Silverlight 1.1 alpha has been refreshed and new alpha bits are now available. Yes, that's right. Alpha bits. Microsoft is still tight lipped about when Silverlight 1.1 will ship, but with references to many more "refreshes" this year I expect we're starting to look in to 2008. Hopefully you didn't plan on doing an .NET development with Silverlight this year. So there you have it. After months of waiting and small refreshes, 1.0 has finally shipped. Download the new bits, check out some early adopters, and then back to the waiting game for 1.1.